[Equest-users] 答复: what's the default equipment control? Previous message: [Equest-users] 答复: what's the default equipment control? Next message: [Equest-users] 答复: what's the default equipment control? I didn’t end up solving it for my building. All my chillers were identical in capacity and part-load curve. I also had one chiller in the plant that never got turned on (ie my load never exceeded the capacity of my plant). Since those were the case, I assumed that the energy cost was the same as if there were a more intuitive control (load a, then load a+b, then load a+b+c). There appears to be an anamoly in your sample where “b” runs by itself for a while (why?) but as long as capacity, part load, etc are identical between chiller the outputs should be similar to the intuitive loading, I believe. I did have to do a little explaining as to why the PS-C reports came out as they did. Subject: [Equest-users] 答复: what's the default equipment control? Thank you for your helps , I just check that, but it seems different than we thought. The PS-H report show the chiller water loop run hours. I add it in the form, so you can get it clear. Now you can find that , the loop run hours for all control types is 2750. 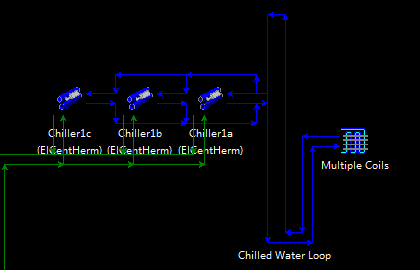 If the default control type as we thought , the chiller 1a should be 2750 equal to the run hours of  Chiller Water Loop, because in any situation , the chiller 1a should first and always be used. Maybe I think too much. But it is a software , I think there must be a sample and clear way for the default control. 主题: Re: [Equest-users] what's the default equipment control? I am guessing, but I BELIEVE Chiller-1 gets to a certain load (think it's defined in the chiller setup), then Chiller-1 and Chiller-2 share the load until Chiller-3 is needed, when all three share the load. See if that makes sense. Subject: [Equest-users] what's the default equipment control? What’s the default equipment control when a loop with more than 1 plant? At first I think the default should be” chiller1a- sequence 1, chiller 2a-sequence2, …” or all the chillers with the same sequence 1. But my experiment shows it different than my think . I make a system with 3 chiller and make a calculation under different control way. So I’m puzzled with how should the software control more than 1 plant when there is no equipment control set? This e-mail may contain information that is confidential, privileged or otherwise protected from disclosure. If you are not an intended recipient of this e-mail, do not duplicate or redistribute it by any means. Please delete it and any attachments and notify the sender that you have received it in error. Unintended recipients are prohibited from taking action on the basis of information in this e-mail. E-mail messages may contain computer viruses or other defects, may not be accurately replicated on other systems, or may be intercepted, deleted or interfered without the knowledge of the sender or the intended recipient. If you are not comfortable with the risks associated with e-mail messages, you may decide not to use e-mail to communicate with In Posse.